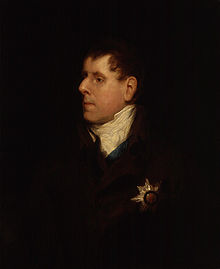 Known as Viscount Trentham from 1758 to 1786, as Earl Gower from 1786 to 1803 and as The Marquess of Stafford from 1803 to 1833, was a British politician, diplomat, landowner and patron of the arts. He was the wealthiest man of the 19th-century. He remains a controversial figure for his role in the Highland Clearances. Sutherland was the eldest son of the Granville Leveson-Gower, 1st Marquess of Stafford, by his second wife Lady Louisa, daughter of Scroop Egerton, 1st Duke of Bridgwater. Granville Leveson-Gower, 1st Earl Granville, was his half-brother. He was educated at Westminster and at Christ Church, Oxford, where he graduated M.A. in 1777. The embassy was withdrawn in August 1792 after the imprisonment of the royal family during the French Revolution. After his return to Britain he declined the posts of Lord Steward of the Household and Lord-Lieutenant of Ireland. However, in 1799 he accepted the office of joint Postmaster General, which he retained until 1801. Sutherland played an important part in the downfall of Henry Addington’s administration in 1804, after which he changed political allegiance from the Tory to the Whig party. After 1807 he played little part in politics, although late in life he supported Catholic Emancipation and the 1832 Reform Act. From 1794 to 1801, Sutherland was Colonel of the Staffordshire Volunteer Cavalry, an early form of yeomanry regiment. Sutherland also held the honorary posts of Lord Lieutenant of Staffordshire from 1799 to 1801 and Lord Lieutenant of Sutherland from 1794 to 1830. He was invested as a Privy Counsellor in 1790, a Knight of the Garter in 1806 and was created Duke of Sutherland on 28 January 1833. The Leveson-Gower family owned extensive lands in Staffordshire, Shropshire and Yorkshire. In 1803 Sutherland also succeeded to the vast estates of his maternal uncle Francis Egerton, 3rd Duke of Bridgewater, which included the Bridgewater Canal and a major art collection including much of the Orleans Collection; both Gower and his uncle had been members of the consortium which brought it to London for dispersal. According to the will of the Duke of Bridgewater, these passed on the death of the first Duke of Sutherland to his third son Lord Francis Leveson-Gower. Sutherland and his wife remain controversial figures for their role in carrying out the Highland Clearances, where thousands of tenants were forced out of their homes. The clearances, described by some commentators as a form of ethnic cleansing, were undertaken between 1811 and 1820. In 1811 parliament passed a bill granting half the expenses of building roads in northern Scotland, on the provision that landowners paid for the other half. The following year Sutherland commenced building roads and bridges in the county, which up to that point had been virtually non-existent. Appalled by the poor living conditions of his tenants and influenced by social and economic theories of the day as well as consulting widely on the subject, he became convinced that subsistence farming in the interior of Sutherland could not be sustained in the long-term. At first the clearances involved relocations from Assynt to coastal villages on the assumption that farmers could take up fishing. However, when the consequences of these actions became clear, the evictions were met with opposition, which was ruthlessly repressed. Resentment mounted when one of Sutherland’s factors, Patrick Sellar, was acquitted of murder and then took over one of the massive sheep farms the evictions created. Condemnation was widespread and the Highlanders’ grievances were heard in the British House of Commons. However, little was done in practice to prevent the emptying of the glens. In 1837 a large monument, known locally as the Mannie, was erected on Ben Bhraggie near Golspie to commemorate the Duke’s life. Eleven years after becoming enfeebled by a paralytic stroke, Sutherland died at Dunrobin Castle in July 1833, aged 75, and was buried at Dornoch Cathedral. He was succeeded by his eldest son, George. The Duchess of Sutherland died in January 1839, aged 73, and was also succeeded by her eldest son, George.